SWBAT choose an operation and strategy to solve an addition or subtraction word problem. Choose a path! In this lesson, students will choose addition or subtraction to solve word problems. How many red counters are there? How many yellow counters are there? I have the student write an addition sentence on the board/chart paper. I repeat the activity changing the number of counters to another number through 20. This will get the students thinking about addition and subtraction sentences. I explain to children that in today’s lesson they will choose the appropriate operation to solve story problems. This lesson allows children to explore and demonstrate their understanding of addition and subtraction. The word problems ask children not only to choose an operation, but also to explain their solution (MP3). The lesson encourages children to choose a way of explaining that works for them. Children may use objects, draw pictures, or write to explain their work. For each problem, I give several children the opportunity to justify their reasoning. Children develop reasoning and communication skills by presenting ideas and by listening critically to others. Children might ask themselves, Does what I am hearing and seeing make sense to me? Is it correct? Is there another way to solve the problem? Encourage children to ask questions of each other: How did you know how many to subtract? How did you know how many to add? Why did you solve it that way? Jane has 13 computer games. There are 8 adventure games. The rest are math games. How many math games does Jane have? After solving the problem, students draw and display a picture to represent how they solved the problem. By having students draw a picture, it will help them to move from the concrete to the abstract aspect of solving word problems. Mary sees 8 squirrels. Jack sees 9 more squirrels than Mary. How many squirrels does Jack see? I have students work with shoulder partners to solve this problem. For the independent practice portion of this lesson, I have students answer the word problems using Choose and operation_worksheet. Part of the assignment will be for the students to determine if they need to add or subtract in order to solve the problem. Jane’s team has 13 children. Some of the children go home. Now there are 7 children left on the team. How many children went home? 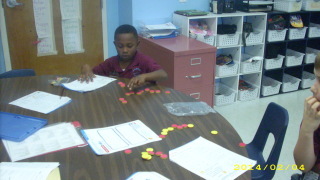 In this picture, a student is using counters to help with modeling the math problems. To close out the lesson, I give each student an index card or piece of paper. They write their own word problem on the card/paper and we think/pair/share to solve them. In doing this as a lesson close out, it gives students the opportunity to use their mathematical vocabulary when discussing with their partner how and why they solve their problem.